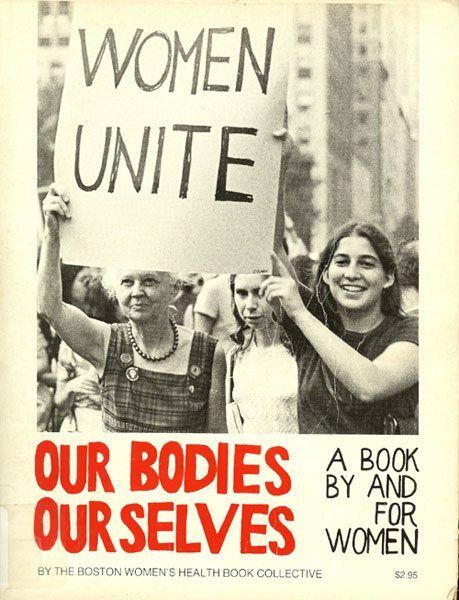 Our Bodies Ourselves made national headlines this month when the Massachusetts nonprofit announced plans to stop updating its signature publication, Our Bodies, Ourselves, several years after Lena Dunham and Gloria Steinem led a fundraising campaign to keep the organization afloat. We came to the painful conclusion, after several years of struggling financially, that we don’t have the resources and infrastructure to continue our main programs using paid staff. On October 1st, we will transition to a volunteer-led 501c3 that will mainly advocate for women’s health and social justice—adding our voices to important political and cultural conversations as we have done throughout our history. National coverage focused on the despair many older women felt about losing access to future versions of the beloved, groundbreaking guide to female health and empowerment—although it’s still widely available, the last edition was published in 2011. The publication’s lasting legacy, though, has seeded its own successors, proliferating far beyond what it uniquely produced a half-century ago. And therein lies the rub: Perhaps this is the organization we all wish to run, one so successful at its central mission that its reason for existence has waned. Does this mean women’s health issues are no longer being distorted? Not at all. The organization itself may have lost some centrality, but it remains a model for small organizations that persist for years on the undervalued human capital of its members. But sometimes, you just need cash—in this case, to pivot to meet the moment with influence. In 2015, the Boston Globe explored the challenges facing the nonprofit, which reportedly saw royalties from the book and companion publications decrease from $34,000 in 2008 to less than $5,000. Even at that time, the organization had innovated beyond print publications—its Global Initiative adapted and translated Our Bodies, Ourselves into 31 languages, and a collaboration with the Center for Genetics and Society produced a website offering families information on assisted reproduction issues, called Surrogacy360. Indeed, by reporter Bella English’s account, the organization took many measures to right itself, including development of professional fundraising capabilities, a move out of expensive Cambridge offices (the few part-time staff members worked from home), and study of a merger or affiliation. A crowdfunding campaign was next, which attracted support from Gloria Steinem and Lena Dunham, feminists from across the generational divide. The campaign hit the initial $100,000 goal, and the organization’s leaders were proud to announce the hiring of a new leader, Julie Childers, in spring 2016. But, wait—a $100,000 goal? For a turnaround and regain of traction? “Stalwarts like the National Organization for Women and Ms. magazine still exist. But their profiles dwindle in the shadow of newer endeavors like Times Up, or Teen Vogue’s recent political makeover,” she writes. During the #MeToo wave, it’s especially troubling to see a nonprofit providing valuable health information to women scale back—especially when large-scale organizations like Planned Parenthood and the Women’s March appear to be overflowing with new donations and interest. Yes, charity is not a zero-sum game, but for small nonprofits, even minor shifts in cash flow or changes in leadership can have a big impact. Despite their best efforts, Our Bodies Ourselves’ coffers have dwindled from $485,000 in 2012 to $279,000 in 2015 (the last year a 990 was on file with GuideStar), plus a $6,500 endowment on hand. (Absolutely no nonprofit should have a $6,500 endowment, by the way, sharpening our point about the need to think bigger financially). You will see many headlines today that revisit the notion that nonprofit enterprises are frail and misbegotten, headed toward a sure and ugly demise. The truth is that nonprofits are inconceivably agile and resilient—but we can always do better.